Why dream about living in paradise when you could move into Penthouse Towers in Highland Beach, Florida? Penthouse Towers is a luxury waterfront condominium building located between the Atlantic Ocean and Intracoastal Waterway in the Southern part of Palm Beach County. These Highland Beach condos sit right in the sand on the beach and surely provide exquisite views of the water for all of its residents. Penthouse Towers is a larger condo community with 136 units spanning 10 floors. These 2 and 3 bedroom condos are sure to amaze residents with their deluxe upgrades featured in all condos. Some of these upgrades include impact windows, private balconies, walk-in closets in over sized master bedrooms, marble floors, granite counters with wood cabinets, and spacious floor plans just to name a few. Residents enjoy looking out of their floor to ceiling windows into the deep blue Atlantic Ocean daily. Kickback and relax while living at Penthouse Towers in Highland Beach, every day will be like a vacation. Penthouse Towers offers a large stretch of private beach for residents to lounge on, along with a glorious swimming pool and sundeck with backdrop of the ocean, fitness center, exclusive clubhouse, and entertainment rooms. This condo community also offers on-site storage, a bike storage room, community laundry center, and underground parking for residents’ convenience. Penthouse Towers condo building in Highland Beach is located just between two major cities in South Florida, Delray Beach and Boca Raton. Residents are a short drive away from the Downtown Delray Beach Atlantic Ave where dozens of high-end boutiques and night-time entertainment is featured or they can drive to the Town Center Mall at Boca Raton as well as enjoy the famed Mizner Park. Penthouse Towers is also situated between two international airports and is within close distance to all major highways. 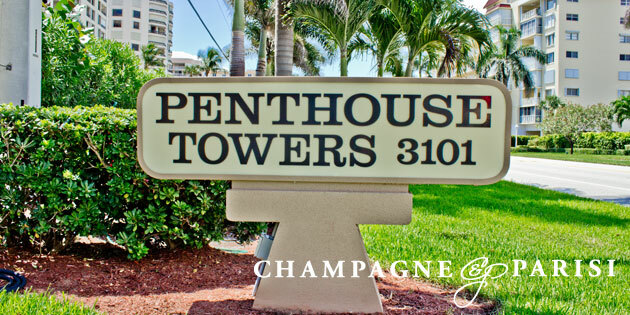 Living at Penthouse Towers condos is luxury, oceanfront living at its finest. Residents who choose Penthouse Highlands are on vacation every day of their lives.